When the sun is shining it’s so lovely to sit outside in the garden. We are having our patio done this year, and I can’t wait to get some garden furniture so we can sit outside and enjoy the summer evenings on the patio. However garden furniture tends to get a little neglected, doesn’t it? Well if you want to make your patio furniture last then take a look at this week’s Get in Your Garden! guest post which is all about protecting your outdoor furniture. 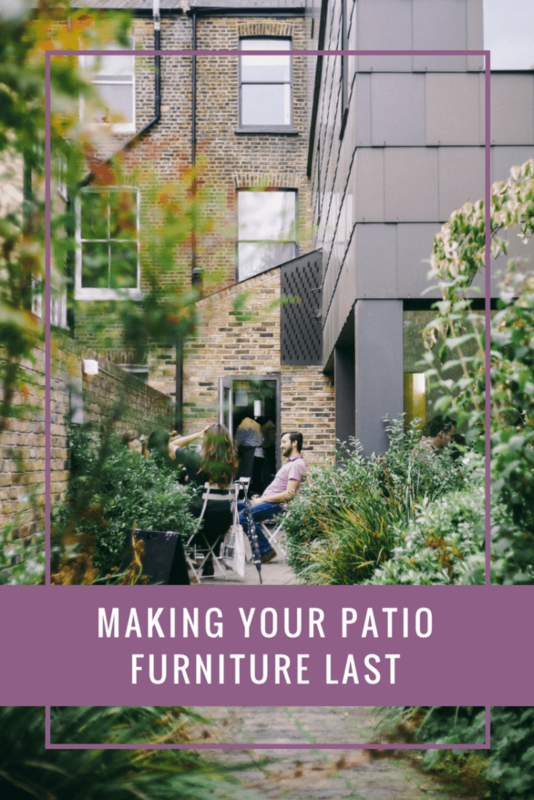 This week’s guest post is written by Sarah from a A Few Favourite Things, and she is focusing on tips to make your patio furniture last. Hello, I’m Sarah a WAHM with three children. I’m a former NHS administrator who now works from home following redundancy. Having moved home last year and finding that we for the first time have a garden to enjoy (rather than a courtyard), we are trying to make the most of it. My blog A Few Favourite Things is a lifestyle interiors site that focuses on hints and tips around the home and garden and showcasing some of my favourite things. It does not matter whether you have recently purchased your patio furniture or it has been around for the year. You want your patio furniture to look great for a long time. It is necessary to regularly clean your patio furniture to extend its life. If your patio has that tropical hardwood type furniture you need to do the following. Firstly regularly apply furniture oil with a soft cloth. This will help your furniture to keep its original look. To clean this type of furniture you can use an appropriate wood cleaner or a little warm water with soap. Scrub with a brush in the direction of the wood’s grain. At the end of this, you should allow the wood to dry before you apply any oils. After applying the oils wipe off the excess. Always make sure the furniture is completely dry before using it. 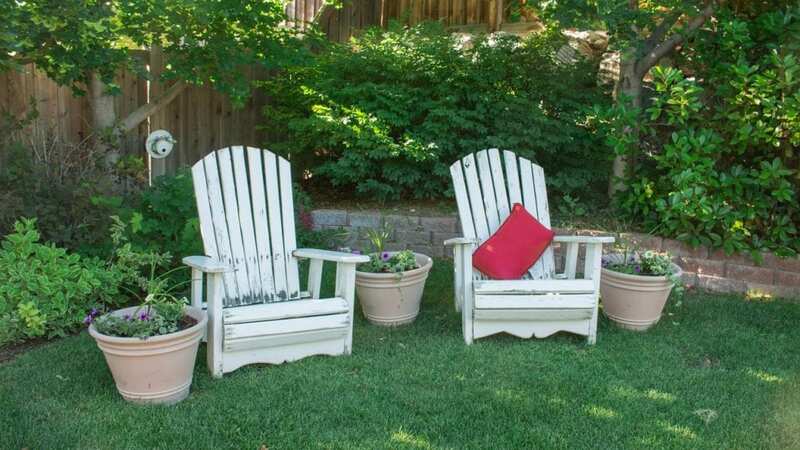 Your patio furniture may be made from wicker and you have never been quite sure how to clean or maintain it. Try the following suggestion. If your furniture has that light buildup of food particles and spilled drink you can simply wash it down with a gentle spray of water. However, if there is a presence of those more difficult stains you may need some soap, water, and a brush. Mix the water and the soap. Use your brush to apply the solution and scrub your furniture. Make sure you remove the soapy solution properly by rinsing with water. Most metal furniture is extremely strong. They appear to be practically indestructible. But they are usually the easiest to clean. When your metal patio furniture needs cleaning you can use your garden hose to gently wash it off, and then let it sun dry or wipe it with a cloth. You should always look out for any signs of rust and can use some sandpaper to rub them down before they get any worse. If you have had your furniture for a long period. You may need to clean then give a touch-up paint job. This is sure to make it look like new. Cleaning and maintaining your patio furniture is a key part of its protection. Also depending on the type of furniture, you have you may need to store them according to the season. Thank you, Sarah. I know when we have had patio furniture in the past, I have been guilty of neglecting it. These are great simple tips to keep your furniture looking good for longer, and I for one will try to follow them when we get our new furniture. If you have enjoyed reading this then you can also find Sarah on Twitter, Instagram, Pinterest or Facebook, or why not pop over to her blog. If you are enjoying the Get in Your Garden! 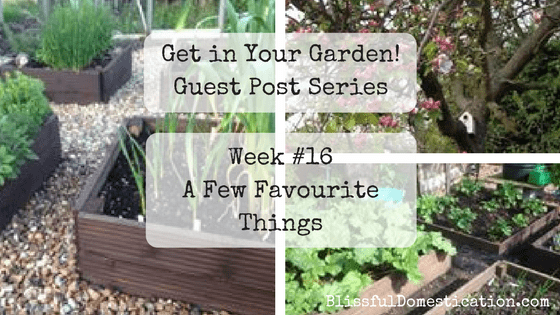 guest post series then fill in you e-mail below and you will get our weekly newsletter so you never miss a post, and no spam I promise!